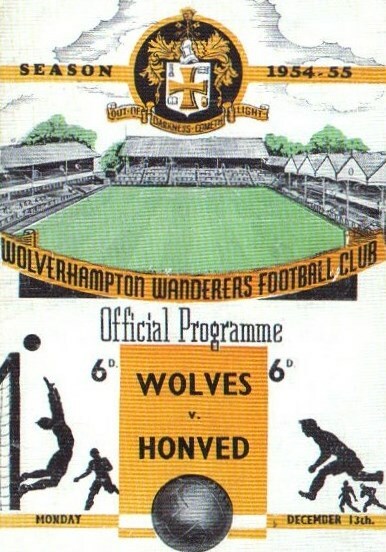 Sixty years ago, on 13 December 1954, the English champion Wolverhampton Wanderers welcomed the great Honved Budapest for a friendly at Molineux stadium. For teams from Eastern Europe, such matches were an opportunity to generate some revenues (though as stressful one given they travelled back on train via London and Paris in order to be back on time for their next championship match). For their Western hosts, too, it was a lucrative affair: the fact that 55,000 spectators attended the match scheduled at 7:30 on a Monday evening gives an idea just how much awe the Hungarians inspired, especially since the consecutive 6-3 and 7-1 thrashings of England in November 1953 and May 1954 respectively. According to some sources, the Molineux pitch was deliberately and excessively watered before the kick-off in order to handicap the technically superior Hungarians. If this rumour is true, the decision was no doubt inspired by the World Cup final in Bern five months earlier, where the German team had no doubt been favoured by the pouring rain – ‘Fritz-Walter-Wetter’, as they called it. Wolves won 3-2, with exactly the same score as the Germans, after being two goals down just like the Germans had been. It seems to have been a rather outstanding match, and both teams had been up to the expectations. The fact that Gabriel Hanot from L’Equipe had bothered to travel all the way to Staffordshire in order to attend this Anglo-Hungarien summit gives ample evidence to their reputation and the interest such a highlight triggered elsewhere. In these days before Live-Tickers and sports channels, Hanot was not in a hurry. For the rotative presses of L’Equipe, the match had ended too late anyway, and his report was due only for the Wednesday edition. Which gave him time to have a look at how the English press reacted to the game. The Daily Mirror’s jubilant praise of the Wolves’ performance, crowned by the claim they were now ‘Champions of the world’, raised his eyebrow. While he agreed that the victory of the home team had been more than deserved, he couldn’t help but consider the Mirror’s heading somewhat over the top. He decided to comment upon it in his article, coming to the conclusion that without at least a return game or, even better, a full-fledged European clubs competition including, for instance, Milan or Real Madrid, such claims could not be upheld. And he finished his report saying that such a competition would indeed deserve to be launched. His colleagues in Paris reacted with enthusiasm and published the article with an additional subtitle announcing ‘L’Equipe launches the idea of a European club championship which would be more innovative and more sensational than a European championship of national teams’. And without having the slightest clue on how exactly they were going to realise it, they were firmly determined to take their chance and start a campaign in favour of such a competition. And they followed up right away: in their Thursday edition, an article signed Jacques de Ryswyck already presented a rather precise outline of the project. There would be one club per federation, there would always be a home and an away leg, matches would be scheduled on mid-week evenings and everything would be broadcast by international television. If that does not sound like the Champions League, what does? Nine months later, after a period of intensive lobbying with FIFA, the newly founded UEFA, and a range of clubs all across the continent who saw the potential of the idea, the Coupe des Clubs Champions Européens saw the light of day. 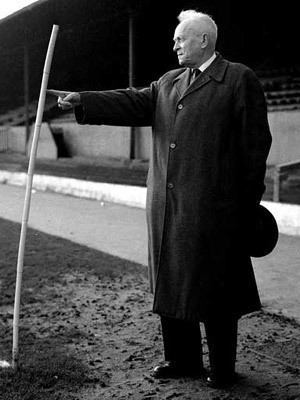 A remarkable success story of entrepreneurial spirit that was simultaneously underpinned by the prospect of increasing mid-week sales on a highly competitive press market, by the shared conviction that the future of football was European rather than national, and the sheer excitement of creating the missing competition, the ultimate yardstick of European football. If there’s one ‘invented tradition’ of truly European dimension, created bottom-up by ordinary people from civil society and producing, decade after decade genuinely European ‘lieux de mémoire’, it’s well the European Cup. In a book published in 1965, the German novelist and journalist Hans Blickensdörfer paid tribute to Gabriel Hanot’s ‘courage and willpower’ in creating ‘footballs common market’ before the launch of the European Economic Community. He added, ‘at the risk of being mocked by those who notoriously know better, I pretend that the European Cup has been an ice-breaker of political relevance’. In December 2014, one cannot help but feel a little bit nostalgic: On the 60th anniversary of their legendary win over Honved, Wolves secured a last-minute 1-0 away win against Sheffield Wednesday which consolidates their place in the no-man’s land of the middle of the table of the English 2nd Division (now pompously called ‘Championship’). Honved, who are already in their winter break and would have been available for a historical re-enactment, will have to fight hard in spring to avoid relegation from Hungary’s top-flight, now called ‘OTP Bank Liga’. L’Equipe itself is fighting against the decline of the printed press. And while the game of 1954 is remembered in England, as several articles over the last days showed, just what football clubs in Europe owe to the visionary French journalist-entrepreneurs is all but forgotten. What’s more: the likelihood of another Anglo-Hungarian summit of European football is not very high for the years to come. In September 1955, the first European Cup started with 16 teams from 16 different nations, including three from behind the Iron Curtain. One year later, there were five of them. Next spring, the Champions League will count exactly one club from Eastern Europe among its last sixteen. European football is more Western than ever, more money-dependent than ever, caught in a system that will perpetuate these two tendencies. Not exactly what its inventors had in mind.